There is a big difference between a team of champions and a champion team. Together we can achieve so much more than one individual can alone. We should never underestimate the power of unity, where people pull together with shared passion and single purpose. The Bible describes this as 'good and pleasant', where God commands His blessing. The blessing of unity translates into every area of our lives - at home, in the workplace, and even at church. Sadly, disunity can flourish in these same areas. In this teaching series of four messages, Brian Houston examines six significant things that can bring people together. By building the right things into our lives, we can know the power of unity and experience the promise of God's blessing. In doing so, we will bring healing and strength, rather than a weakened state of division and disunity. 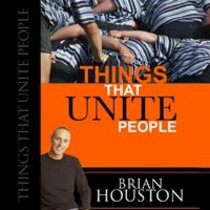 About "Things That Unite People (2 Cds)"